The lawsuit was filed in 2015. Defendant GE filed motions for improper venue and to bifurcate and delay discovery. Briefs were exchanged and Judge Benita Y. Pearson maintained jurisdiction. The Judge did bifurcate discovery, and limited discovery necessary for motions to dismiss has already been undertaken. The bulk of discovery has been held until Judge Pearson rules on GE’s motion to dismiss. GE’s motion to dismiss has been fully briefed, and we are currently waiting on a decision from the judge. The former chief labor negotiator for General Electric Co. is suing the company over pending changes to its health benefits for retired nonunion employees. Dennis Rocheleau, who lives in Waupaca and Fairfield, Conn., and Evelyn Kaufman, another retiree living in New York, contend GE violated federal law by ending and replacing its existing health plan for retirees without good reason. The lawsuit was filed in federal court in Milwaukee. GE plans to end its existing health plan and in its place give retirees and spouses $1,000 a year to buy a health plan on what is known as a private exchange, an online marketplace. 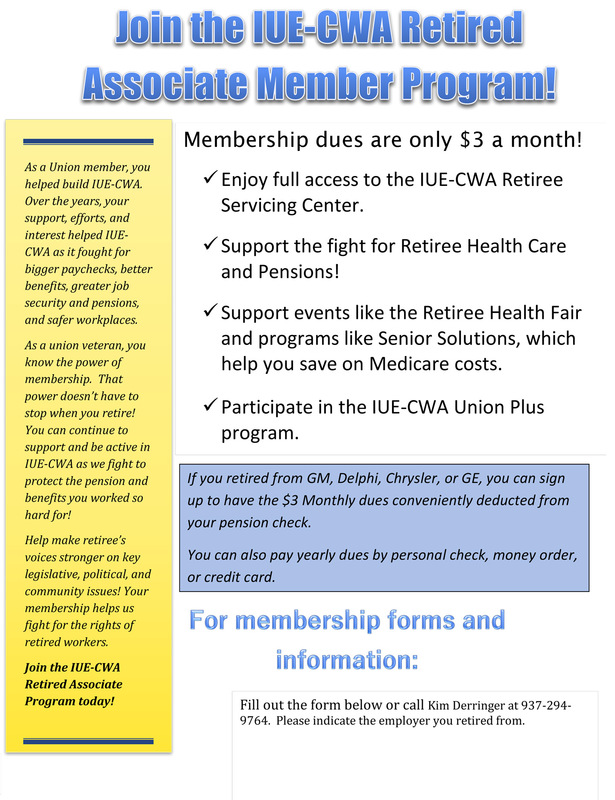 On Wednesday, June 4, 2014, the IUE-CWA held a health fair in Dayton, Ohio. It was held at the Dayton History Museum,outside under a huge circus-like tent. The weather wasn’t so agreeable it rained during most of event. Still, we had forty-four health care vendors and we offered several health screenings and over six hundred retirees from a fifty mile radius of Dayton attended. All vendors and two of our larger Dayton IUE-CWA Locals supported the event either financially or with door prizes. The event ran from 10:00am – 2:00pm. Everyone was eligible for the door prize drawings. Those who paid the three dollars per month retiree union dues were eligible for the more valuable prizes. It was a great turn out for a gloomy day. Retirees Receive Settlement of Lawsuit Relating to Social Security and Medicare Taxes Withheld from up-front Signing Bonuses. 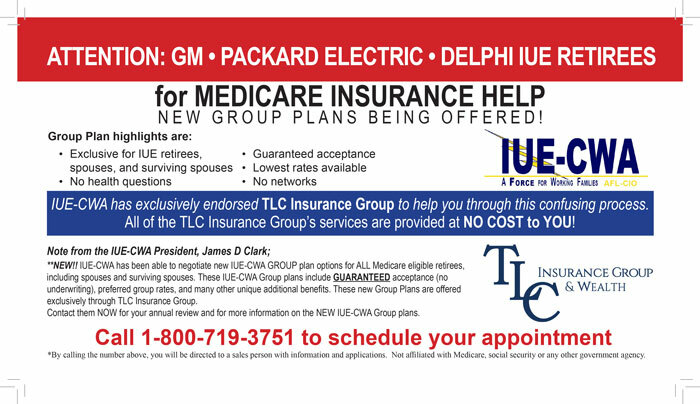 Employees who received one or more up-front signing bonuses paid by Delphi Electronics Corp. or Delphi Automotive System Services, LLC upon ratification of collective bargaining agreements between Delphi and the IUE in 1999 and 2003 are eligible to participate in a settlement between Delphi and the United States concerning the Social Security and Medicare taxes which were withheld from those payments. Delphi sued the United States for refunds of FICA taxes withheld from the signing bonuses as described above, arguing that the payments were not “wages” subject to FICA taxes. Delphi and the United States have agreed to settle the lawsuit for an amount equal to 35% of the FICA taxes claimed in the lawsuit, plus interest. Based on their evaluation of the facts and law and the costs and risks of litigation, Delphi and the United States determined that this settlement is fair and reasonable. Checks have been sent to employees/retired employees who are eligible for a refund. Those checks need to be cashed by November 13, 2012. By cashing the check, you elect to participate in the settlement and agree to waive your rights, if any, to claim any additional refund of the FICA taxes withhelp from your signing bonuses. If you do not cash the check by November 13, 2012, you will not be eligible to receive any share of the settlement proceeds and the check will be void. The amount of each check sent out generally equals 35% of the amount by which treating your signing bonus as “wages” for FICA purposes increased your FICA taxes, plus interest. If you agree to participate in the settlement by cashing the check, the interest on your share of the settlement, which is stated on the check stub, will be taxable to you as interest. You should consult with your tax preparer for more information on this subject. If you need more information, or have received a check for a deceased member, call the Delphi FICA Settlement Administrator at (866) 621-4158. On February 2, 2010, the Pension Benefit Guaranty Corporation (PBGC) mailed letters to approximately half of IUE-CWA’s retired members whose pension was surrendered by Delphi Corporation. The rest of the members should receive their letters in the first week of March. The letters communicate the amount of pension that the PBGC will pay after any reductions that the PBGC may apply. This week General Motors will be following this communication with letters that will explain the process they will use to pay the “top up” amounts so that Delphi hourly retirees will continue to collect the same amount of pension pay that they have been receiving. We are hoping that this transition will be as seamless as possible for our affected members. Wayne Calico, #775, Bernie Sanders, Independent Senator – Vermont, Keith Bailey, IUE Retiree Representative, Roy Rogers #161 attending a press conference on Social Security, Medicare,Medicaid, and Veterans Summit. Senator Brown, IUE Retiree Rep.,Keith Bailey, Ohio Alliance for Retired Americans President, Wayne Calico , Secretary-Treasure of Local 775 Retiree Club Met to discuss protecting and enhancing the Chain CPI for Social Security.